Ever think about pulling a 25,000-pound Fire Truck? Well, Fire Fighters in central Florida do it for fun. Actually Fund Raisers. The men and woman of the Fire Service understand “Brotherhood”. Fire Fighting is a Team Event, so we don’t allow for ”Lone Wolf’s” or “Freelancers”. Team work is key to safe fire ground operations. So when a team member needs help we all pitch-in. A Lake Mary, Florida fire fighter’s family member was in need of help because of a rare and dangerous medical condition. Even with insurance coverage situations like this require lots of support. 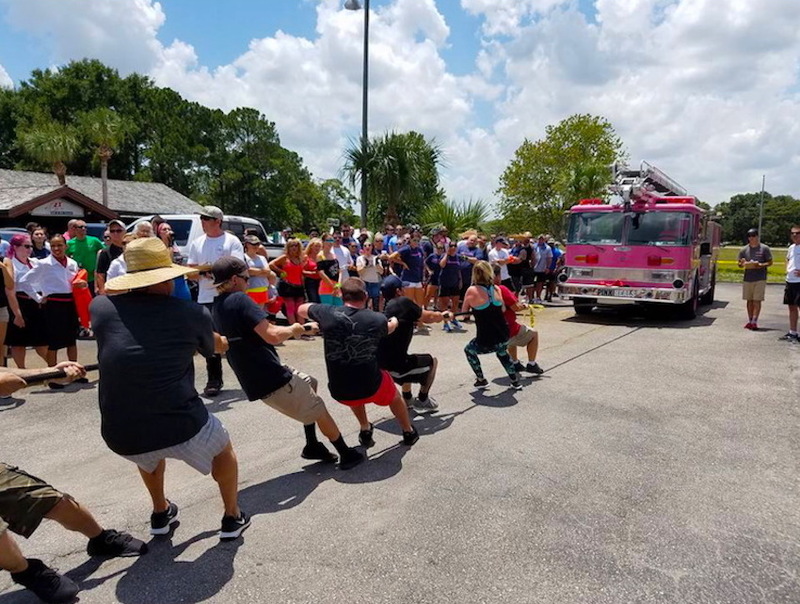 Fire Fighters are very competitive my nature, so creating 10 member teams to pull a 25.000-pound Fire Engine is a Hot Ticket for a Fund Raiser. Our team of Emergency Directors from 1-800-BOARD-UP and Orange County Construction 911 were there to answer the “Call to Duty”.